Free standing punching bags eliminate the need to worry about a punching bag stand which often adds up the cost of acquisition as well as requiring additional space. 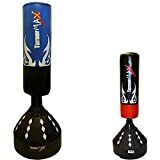 Here are the most popular and best rated free standing punching bags that you could purchase and improve your boxing and MMA skills with. FREE-STANDING DESIGN - Traditional punch bags require you to hang them from the ceiling, which can be messy and create holes. 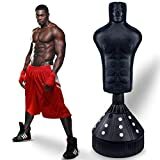 No nuts and bolts are needed for this punchbag, which can be pushed to the side when you've finished training. NARROW, STABLE BASE - Narrow bases are often considered to be less stable than wider bases, but once filled with sand, this is no longer the case! The narrow base also makes it easier to move around the bag, so you can bob and weave without tripping over! 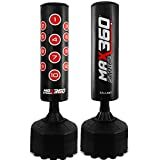 SHOCK ABSORBING - Fully padded with 5cm-thick EPE foam which absorbs every hit, protecting the punching bag from damage and preventing it from moving out of place. EASY ASSEMBLY - You can have your bag up and ready-to-punch within minutes. A great partner for sparring techniques or target training. TRAINING PARTNER: Mytra Fusion Pedestal Training Bag is proved to be one of the prime addition in the boxing equipment by Mytra that can take the training to another level. Designed to provide and ultimate workout comfort and enhance the training capacity of the Athlete. The 6 Feet Free Standing Punching Target allows it to be used in various disciplines. IMPROVISED COMPOSITION: Made from high grade synthetic PU leather this free stand punching bag can withstand the most extreme punishment. Stitched using a RAW Triple-needle fleece Pico-thread which strengthen the composition and make this ball extremely durable. PUNCHING PATTRENS: The twelve punching dots allows the trainee to use it in multiple workout routines and to build Rhythm and focus. 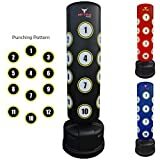 With the twelve punching patterns this Multi Functioned Mytra Training Target has the capacity to aid the trainers and the athletes to enhance their capabilities in the ring to fulfill the growing training needs. BASE: The hard coat Polyethylene base holds up to 270 pounds of water or sand for the stability of the free standing bag it enhances the punching techniques and add more to the skill. The Inertial O-Round design allow the base to withstand the torque produced by extreme punching. PRECISION & ACCURACY: Throwing combinations on traditional Punching Bag causes a fighter cross his own technique decreasing his accuracy. 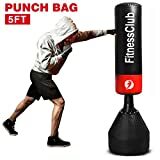 With the all strike standing punch bag the fighter is hitting one target which increases the striking precision and accuracy. Being able to move and improvise with mytra strike pad changes a traditional bag workout for spontaneous sparring session to a memorized choreography. More realistic training for many different techniques. For many combat sports, boxes, etc. suitable. Rex Leather Boxing Gloves In 10oz Size & Please Note: This Item Comes in 2 Boxes, Top and Base, we send both parts together but due to busy season some times courier companies don't deliver both parcel at same time. Free standing punch bag in blue is launched after the red one standing at almost 6ft. The vinyl outer surface is high-quality which will last more than a decade. 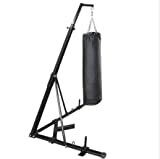 The base has a wide diameter to support this heavy duty free standing punch bag. Ultra steady base, easily assembled, 175 cm height and a wide 65 cm base diameter. Its smooth surface almost gives us a feeling of real leather; the base should be filled with sand or water. Remember to place this free standing boxing bag on a carpeted surface to avoid toppling. Heavy-duty body opponent bag "BOB" (punching torso) with life-like body shape and six-pack. Made of very in-dense foam and made for heavy punches and kicks. Flesh like torso creates realistic training. Can be used with or without bag gloves. When the base is filled (with either water or sand), it weighs around 110kg. Adjustable height: 6 levels; up to 180cm.